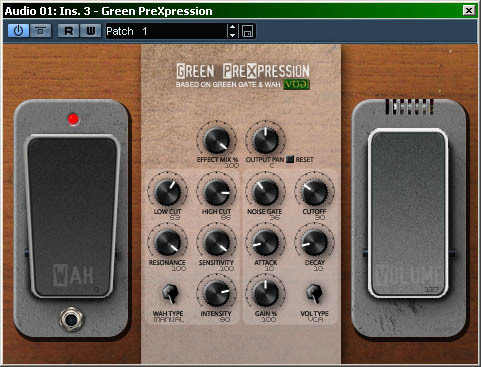 If there is a freeware vst gate and/or wah on inserts on any of my audio channels, those definitely are Green Gate and Green Wah, developed (my guess is in SynthEdit) by Wurr Audio Engineering. The Green PreXpression merges these two but goes a little further: an incoming volume swell pedal has been added (responds to MIDI CC#7), an output pan knob for more routing possibilities, a wah pedal of course (responds to MIDI CC#11), and the wah module fx mix knob. Watch the pedals in action as you step on your MIDI foot controller! You do have one, don't you? If necessary, you can always disengage the wah module. Download Green PreXpression (5,2 MB). brav, but working well with my D6 sounds and some filters in chain ! where does this Green PreXpression come from ? just missing a midi learn funktion ! !